I wasn't exactly chomping at the bit to review a basic ballpoint like the Pilot Rexgrip 0.7mm, even more so after my bad experience with the 1.0mm model. But I said in that review - over two years ago - that I would get one of the 0.7mm models, and I'm glad I did. Sometimes low expectations lead to the best discoveries. So my first question is: Where have you gone Der Bingle? The once prolific commenter mentioned in my original review that while I disliked the 1.0mm model, I needed to give the purple 0.7mm a shot. I finally took him up on that advice, and was happy to find a pen that was completely different than the original one I reviewed. I was very pleased at how clean the lines were, especially with my small, fast paced handwriting. I actually tried hard to find something I disliked about this pen, and I couldn't. Where the original was streaky and light colored. this one is solid and vibrant. A totally different experience. The barrel is pretty basic, but what do you expect from a pen that only costs $1.50? It is very similar to the Pilot G-Knock - a barrel I like very much and is very comfortable. There aren't a lot of options out there for purple ballpoint pens, so this one is definitely worth a look. 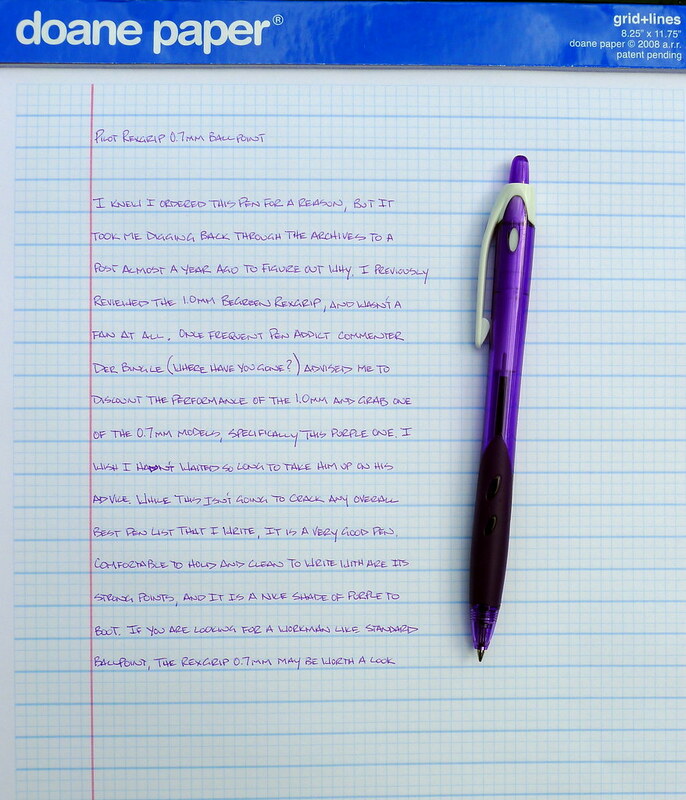 Pilot Rexgrip Ballpoint Pen - 0.7 mm - Purple Body - Purple Ink from JetPens. Writing Pad from Doane Paper. Posted on February 16, 2011 by Brad Dowdy and filed under Ballpoint, Pen Reviews, Pilot, RexGrip.